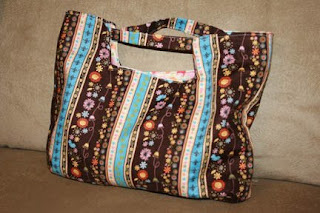 After making several gifts, I really wanted to try a project for myself from Bend the Rules Sewing by Amy Karol. The fabric is from Heidi Grace Designs (bought at JoAnns Crafts), and both the outer fabric and the lining are in the same butterfly line. This pattern is the Charming Handbag. I love this pattern. It's a cute shape, and fairly easy to make. It's just big enough to hold my keys, wallet, and phone. Maybe my point-and-shoot camera if I'm careful (since the pattern doesn't include a closure, I have to be really careful). It is small, but is a good size for an evening out. I have always carried a purse separate from my diaper bag anyway (actually, I'm a little embarrassed to admit how many bags I do carry). The straps are really short, so this is definitely a handbag and not a purse. The book does suggest experimenting with the size, and I'm working on a larger one that I hope will be a tote bag. I'll let you know how that goes. Wow...you are on a roll with sewing. I am adding learn to sew as a personal goal - probably not this year though. Thanks for inspiring me! Cool handbag!! Handmade stuff is my favorite... It is best as gift! !